Compositions for improvising chamber ensembles with electronics. Cell Structure and Tarpit feature sfSound Group; the title piece features Wrack and Rova Saxophone Quartet with Tim Perkis and Gino Robair. Orgone Accelerator is a stereo realization of a work for 8-channel sound diffusion. “Any attempt to pin down Bay area musician Kyle Bruckmann is a study in futility. Here’s someone who jumps from collective improvisation to the skronk-rock of the group Lozenge to jagged compositional forms for improvisation with his group Wrack to electro-acoustic explorations with his duo EKG along with Ernst Karel, to name just a few of his forums. Through all of these settings, working with the notoriously finicky oboe and analog synthesizers, he has managed to carve out a distinctive approach, balancing a formalist sense of structure with a spontaneous sense of group interaction. 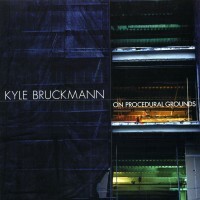 Bruckmann’s new release, On Procedural Ground, is a great place to hear how all of this comes together. “Cell Structure” kicks things off with the ragged shudder of analog synth dropping back to reveal layers of breathy sputters and hisses of oboe and Matt Ingalls’ clarinet. From there, the piece evolves as the two play tag-team across sets of de-tuned intervals torn through with clangorous shards of electronic rumble and grit. The tensions build between raw electronic timbres and quavering reed tones, skirling cries that sound almost like sine waves, and agitated activity that moves with jump-cut precision. The half-hour long title piece which follows is almost orchestral in contrast. Here, Bruckmann deploys his group Wrack (viola, bass, clarinet, bass, and percussion), Rova Saxophone Quartet, and live electronics courtesy of Gino Robair and Tim Perkis across a score that moves from sections of pointillistic abstraction to coursing, full-tilt stomp. What makes this work so well is how attuned Bruckmann is to the ensemble; he’s clearly structured the piece around the specific voices and playing strategies of the members as well as an ear toward how to combine the core ensembles in constantly changing sub-groupings. This is all cast against the active field of live electronics, again, playing the textures of acoustic instruments and pure electronic tones off of each other with canny effectiveness, though this time, featuring some blistering solos, particularly from the Rova crew. “Orgone Accelerator” takes “Cell Structure” a step further; this time bringing electronics to the foreground and coloring the throbbing, shuddering fields with wafts of oboe and English horn. Composed for “8-channel sound diffusion,” the stereo recording still manages to capture a sense of being engulfed in the waves of thrum and glitch shot through with spatters of key clicks, reed pops, and cracked double-reed overtones. The recording wraps up with “Tarpit,” another ensemble piece, this time featuring sfSound, a group of like-minded composer/improvisers Bruckmann began working with when he first moved to the Bay-area in 2003. Here, the oboist is joined by Ingalls on clarinet, John Ingle, on alto sax, Gino Robair on prepared piano, Benjamin Kreith on violin, Tara Flandreau on viola, Monica Scott on cello, and Kjell Nordesen on percussion and electronics. For this piece the musicians are grouped in various pairings, floating deconstructed melodic threads over unstable, layered planes of drones. The group revels in the malleable intersections of activity and stasis to create a piece of slowly unfolding richness as events constantly sparkle through the hushed dark, harmonic cushion, building to a lush full-on density shot through with buzzing detail. While no single release provides a definitive look at Bruckmann and his music, this is a damn fine place to start.